A mid-Missouri lawmaker is praising Governor Mike Parson’s state government restructuring plan, saying it will allow the state Department of Economic Development (DED) to focus exclusively on economic development. The restructuring plan involves four state agencies, primarily DED. Governor Parson says the plan highlights his commitment to fundamentally reshaping state government, while demanding greater efficiency and improving customer service. State Rep. Travis Fitzwater, R-Holts Summit, supports the plan, saying it will allow DED to focus on its core mission. DED has 865 full-time employees, which is more than any of its Midwest competitors. Governor Parson says Missouri ranks 14th among its Midwest peer states in gross domestic product (GDP). “I mean the numbers, when you look at the amount of employees in DED compared to other states, it’s overwhelmingly larger here. When you look at the focus areas of our Department of Economic Development, it’s overwhelmingly larger than the states surrounding us,” says Fitzwater. Governor Parson has said Missouri ranks ninth among its Midwest peer states in job growth and eighth in wage growth. The governor’s plan involves moving DED’s Division of Workforce Development to the Department of Higher Education and returning the Division of Energy from DED to the state Department of Natural Resources (DNR). It also will move the Office of Public Counsel and the Public Service Commission (PSC) to the newly-named Department of Commerce and Insurance. 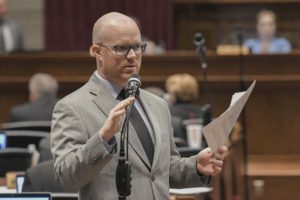 It would also make the Missouri Arts Council part of the Lieutenant Governor’s office. Governor Parson says the restructuring plan will take effect on August 28. “Missourians deserve the best and on August 28th, when the transition period concludes and the reorganization fully takes effect, that’s what we will deliver,” Parson says. The governor says DED has had seven directors in the past decade. He also says that DED will shift to have staff based across Missouri, to better meet the specific needs in each region.